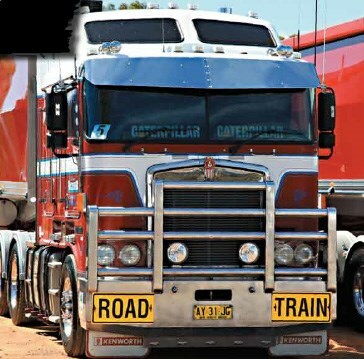 There’s newer model Kenworths around, but Kiwi Ben Earle prefers Kel Baxter’s Cat-powered 2008 Kenworth K104B. Peter and Di Schlenk report. Like many Kiwis, Ben Earle is having a long paid holiday in Australia. He came across the ditch 11 months ago, linking up with Kel Baxter at Berrigan in New South Wales. He’s been driving for Baxter’s ever since. "I landed here on August 1 and went straight to Baxter’s. My mate Shane, who had been with Kel for nine months, lined the job up for me. I was here for a week and Shane went away on holidays. I soon got to know the area and it’s all been good," Ben grins. Since joining Baxter’s Ben has been up to Brisbane, out to Cobar and then down south. He was put behind the wheel of a Kenworth K104B with a 2.8m cab, but it’s what’s under the cab that Ben loves — a C15 Cat. "It has 970,000km on it and still does the hard yards every day," he says. "I won’t be getting out of this one in a hurry, that’s for sure." It’s because of the Cat that Ben wouldn’t swap the K104B for a K200. He says there are seven big cab Kenworths in New Zealand so he is rapt to be driving one here. The Kenworth is a 2008 model and, although it was a little run down when he first arrived, Ben says it’s a work in progress. He has brought the tanks back up and is hoping that it will look a million bucks by this time next year. There are 28 trucks in Kel’s fleet and during harvest time there are different combinations that go to work. "Kel is an innovator and likes to push the boundaries and try new things," Ben says. "He is a believer in the AB-triple concept. "Kel has just purchased two tri-axle dollies which allow us to carry another 5 tonnes. "As a road train with a tri dolly, it tows so much better. There is no jerking around, you don’t get all that shunting coming through and reversing is so much easier," he explains. Ben didn’t have any trouble getting his road train licence in Australia. He had driven B-doubles in New Zealand, although they’re called B-trains there. "I needed a letter saying that I had driven B-doubles for more than two years and I had all the paperwork here, so I pretty much swapped over straight into it," he says. As yet, Ben has not had any difficulties with Australian rules and regulations. He describes them as somewhat similar to what is over ‘the ditch’, but everything else is a lot different when comparing the two. "Trucks have twin steer over there because we pay road user charges. Here it is all included with the rego and all that. "There are only seven of these big cabs in New Zealand simply because everyone is doing day work, short-haul where drivers are home every night and over there you couldn’t have a B-double on the back of a big cab as it would be too long," Ben explains. While Australian roads remain a contentious issue with most operators, Ben believes they are pretty similar to NZ, with some being worse and some better. However, he enjoys driving on the freeways around Melbourne and the ease of access when travelling down to the Geelong silos. "Back home we have no bullbars, no snakes and no kangaroos," he says. "I’ve hit a lot of kangaroos … I’ve lost count of how many. "The first one was interesting. It gave me the shits, but they don’t worry me now," Ben chuckles. Ben loves the variety of the work with Baxter’s. It is not just carting grain but lime, grapes, cotton, fertiliser etc. Ben and Shane were looking to leave Berrigan and head up to Goondiwindi to haul cotton seeds. "We will be going in the next couple of weeks for about six weeks work. Both Shane and I are single, which is a big advantage. "I’m happy to get around more. As present, I like to go away and do it a lot. I lived in the cab for the first three months but now we have a house. "It’s good to be single but I would like to settle down one day. I’ve got a few years left to enjoy first," Ben smiles. For now though Ben is happy to have a big holiday and get paid while doing it. "Kel is great to work for. I love the truck and enjoy the wide open spaces. It’s all good," Ben says. "Plus I like the tipper work and all the variety that comes with it." 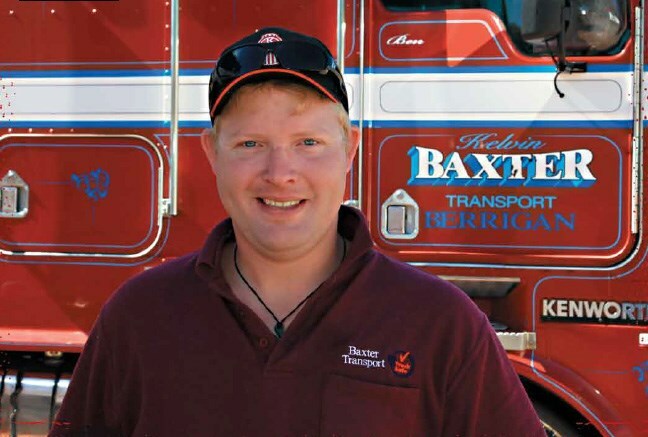 While Ben and Shane are enjoying their paid working holiday, both men are appreciative that Kel Baxter gave them the opportunity to have a go at Australian trucking. Find Kenworth K104B trucks for sale. 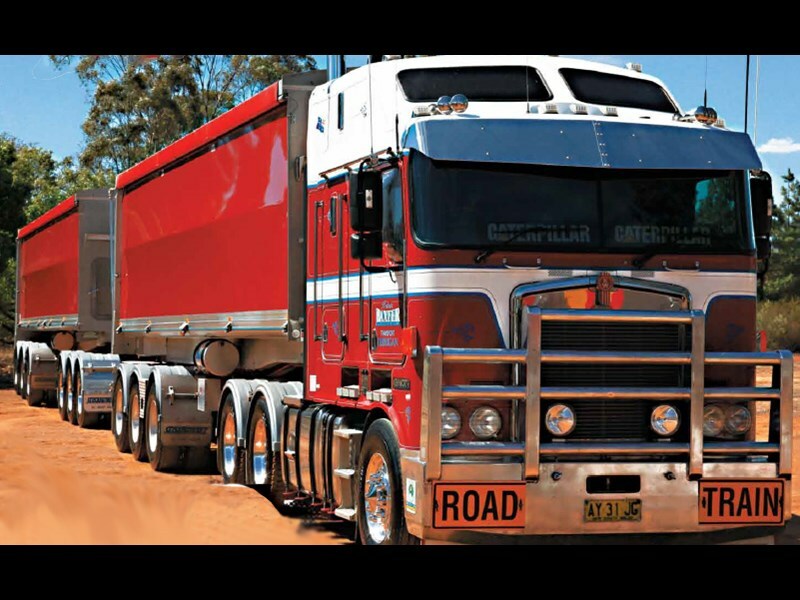 Search for new Kenworth K104B specs.